Get into the spirit of Christmas and spend time together with your loved ones at Surf Bay Holiday Park. Our fabulous holiday homes are available throughout the festive season and are the perfect place to have a cosy and snug, magical Christmas. Make the most of the holidays by packing up and spending some refreshing time by the sea in quality accommodation. 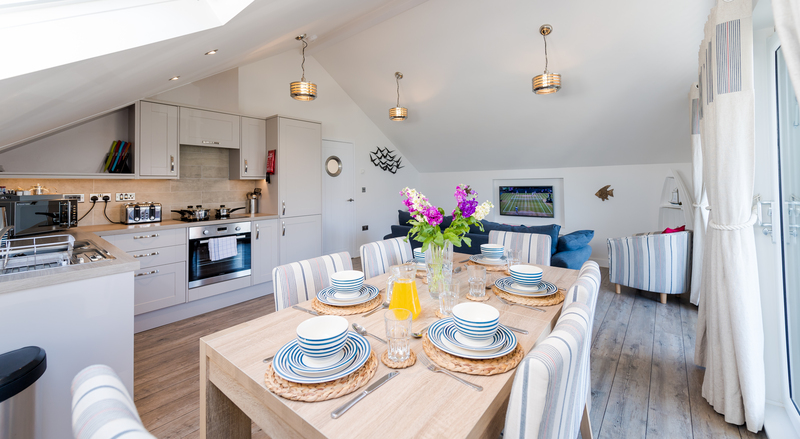 Our apartments and extra warm static caravans can sleep up to eight people, so you can bring all the family including the dog as some of our units are pet friendly. If you really want to indulge yourselves then we've got that covered too as we also have a selection of holiday homes that are available with your own secluded, private hot tub! Our Christmas breaks start on the 23rd December and are available to book now. Book yours today and give yourself and your family the most memorable Christmas present ever! There is so much going on around Westward Ho!, Bideford and the whole of North Devon for the Christmas and New Years celebrations this year. Enjoy a Santa Steam ride at the Lynton and Barnstaple railway, the Christmas lights and great shopping in both Barnstaple and Bideford, the super Xmas Market in Braunton. The pantomime at the Queens Theatre in Barnstaple is always a great day out, Ilfracombe has won £10,000 for new lights this year and will definitely be well worth a visit and Bideford on New Years eve is legendary, with probably the best location and reputation for celebrations in the South West.